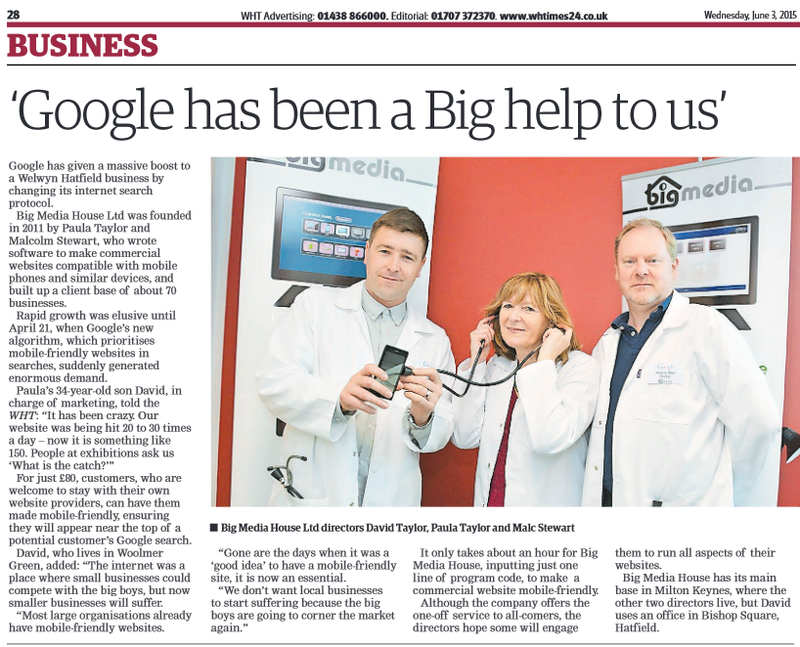 The Google Mobile Web Doctors made an appearance in the business pages of the Welwyn and Hatfield Times on 3rd June 2015 after our approach to helping small and medium businesses become mobile-friendly attracted the attention of journalist Alex Lewis. David Taylor, who now heads up the sales and marketing efforts for Big Media, commented in his interview with Alex: David, “The internet was a place where small businesses could compete with the big boys, but now smaller businesses will suffer. Gecko is a tool that allows us to convert a site to be mobile-friendly. The first pass is to add a line of code to a page or a site, in a very similar way to how Google Analytics is included, that sets a mobile centric baseline to the way a site behaves on mobile. This invariably benefits from design tweaks that take into account specific elements of the individual site, and the result is a site that passes the Google Mobile test AND appeals to site visitors. Chameleon takes a more advanced approach, by adding the capability to the customers site of device recognition. Chameleon essentially allows responsive design techniques to handle most of what is needed for sites to work cross-platform, but builds in a future-proofed aspect by catering specifically for various devices, such as Android, Apple, Windows and Blackberry mobiles and tablets, PCs and on to Games Consoles and Smart TVs. “If browsing ends up being a mainstay for in-car sat-nav systems, Chameleon will be ready to cater for those as well”.